Last week we discussed a US government contractor that offers several security services, including “Cyber Security” a service, while having hacked website, which we had run across after they were in the news for their involvement with questionable practices at US Housing and Urban Development (HUD) department. That incongruity between offering security services and not being able to secure their own website, makes it seem not all that surprising to us that in follow up reporting on the situation with the HUD department it was reported that the company was possibly engaged in fraudulent billing as well. There is another thing we noticed in relation to the hack, though, which is that Google is currently incompletely warning that they are aware that websites are hacked. Being a sitelink versus as standalone result should have no impact on whether this type of issue is occurring (and that is the case with this website), so Google should warn there as well. Google’s flagging that websites are hacked (“This site may be hacked.”) is a good thing and from what we have seen their claims are highly accurate. A reoccurring problem we found in cleaning up hacked websites, though, is that after the websites have been cleaned is that Google will claim in the Security Issues section of their Search Console that the issue has been detected days after it has been resolved. No change had been made to the website on either of those days, so the result would have been the same the day before. Since we deal with hacked websites all the time we are aware of this issue, but for clients or others who might be trying to deal with a situation on their own it is easy to think that this could cause unnecessary distress and wasted time spent trying to deal with an issue that has already been dealt with. Hopefully Google will work on correcting this. Early last year Google changed some of the underlying technology used in their process of of handling websites they suspect of being hacked (which leads to a “This site may be hacked” message being added to listings for the websites on Google’s search results). More than a year later we are still finding that the review process for getting the”This site may be hacked” message removed after cleaning up such a website is in poor shape and likely lead leading to a lot of confusion for people trying to navigate it if they don’t deal with it’s problems on regular basis (like we do). While we think that what Google is doing by warning about these situations is a good thing, the current state of the review process is not acceptable. To give you an idea of what are people are dealing with lets take a look at what we just dealt with while getting Google to clear a website we had cleaned up. In this case Google detected that spam pages were being added to the website, which they refer to as an URL injection. 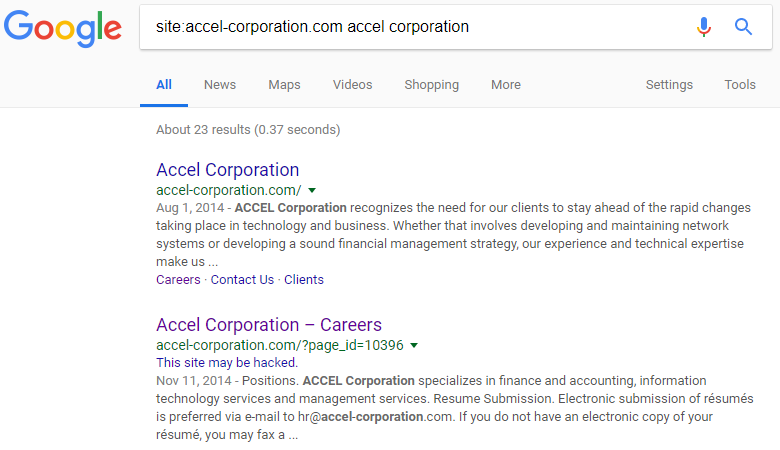 Before requesting a review last Monday, we doubled checked that the spam pages no longer existed using the Fetch as Google tool in the Search Console, which allows you to see that what is served when a page is requested by Google. The URL they listed on the Security Issues page was “Not found” when we used the tool, indicating that the spam page was no longer being served to Google. At this point we also checked the website over to make sure the malicious code hadn’t returned and it hadn’t. Considering that nothing changed between Saturday and today, that detection on Saturday would seem to be some kind of a mistake. Seeing at the page wasn’t even being found this doesn’t seem like an understandable false positive, but something seriously wrong with their system. If you weren’t aware of that how problematic the process is, you might have been very concerned upon seeing the new false detection. The fact that it took them a week to finally clear the website also doesn’t seem to be an acceptable in this case.